keep the boot this time. Why did I call you Sonia, Beth? I’m definitely losing it!! Oh boy!!! Healing thoughts are with you!!! Ughhhhhhh. Sorry for the pains! 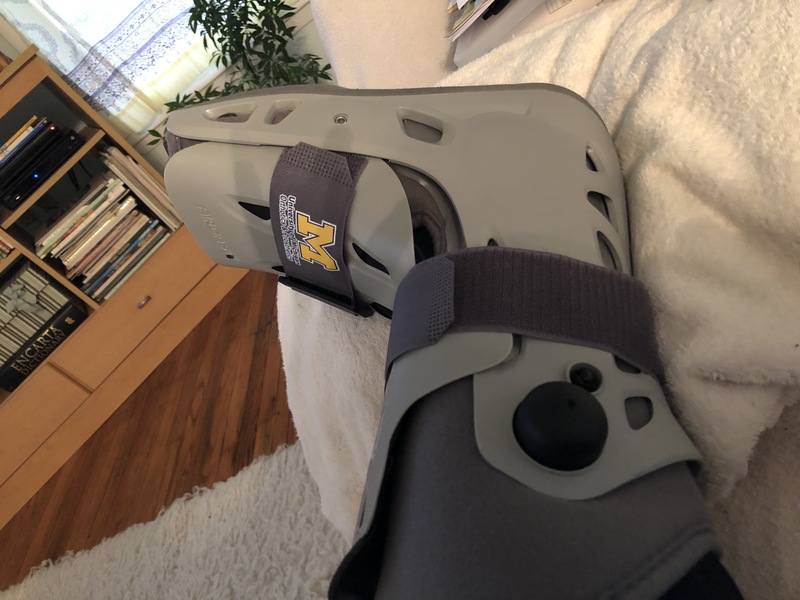 Hope it heals quickly and that’s good thinking….to keep the boot. What’s his or her name? Mine was Herve. I hope you’re unbooted soon! Yikes! Hope you’re feeling better soon. you know it! fashion statement ! 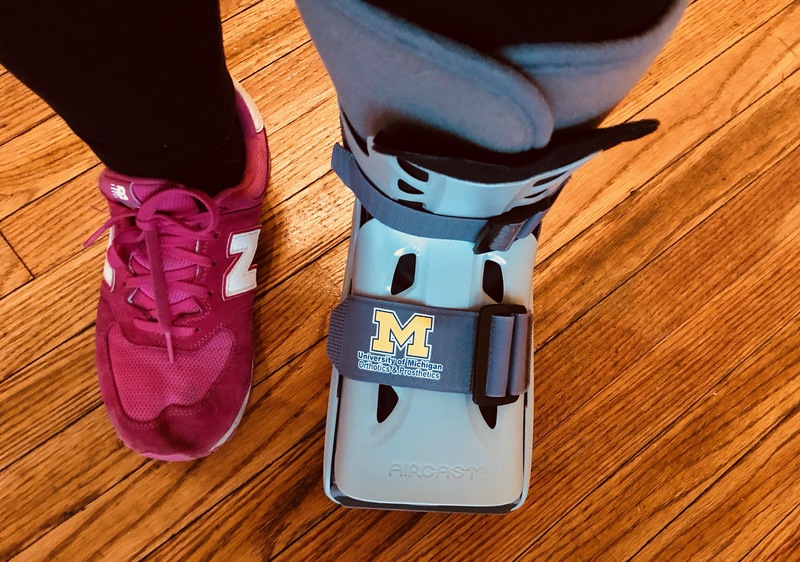 I hope the nifty Wolverines version of your boot helps you heal more quickly … and keeps your spirits higher, Beth. If you had one for the other foot too, you could do Frankenstein imitations… Heal up, Beth. Those kinders need a playmate! they would have loved that! Hope it gets better quick. Praying for a quick and full recovery so you can be unbooted. Ow. Running on ice??? OMG LOLOL I hope you feel better quickly and are back to dancing and having fun. It sounds like a wise idea to keep the boot this time! I love the title and quote included with this post. May you heal quickly and well. Feel better soon! We need to send you some bubble wrap! Sorry to hear you’ve had a mishap, I hope you’re not down too long. i don’t expect it will be too long – thanks! I am sorry to hear that. :( I know what it feels like though, I am only 12 but I have broken my arm twice, the same arm, the same spot. Hope you get better soon though. I have. Hope you recover soon to! Oh for God’s sake, Beth!!! Tsk, tsk. Running on the ice. Ouch. Try ice skates the next time. Get well soon! You just made my day by listing how you injured yourself over the years. I work for a Podiatrist, and when a limper comes in, I start with “Oh, looks like you’ve been living life.” There’s always a silver lining. Feel better and remember that ice is your friend .. the more the merrier. Been there. Oh, the indignity of it all. You will not give up though. At least ice is slippery and makes for a decent excuse. Mine was the clumsy step I didn’t see. Take care and feel better! Oh, noooo! I hope you will heal fully and quickly, Beth. I hope you can manage ‘boot-less’ soon! Oh, no! We have one in our laundry room that my son wore last year. Does yours have that little button so you can pump air into it like you’re fancy? yes, one on each side! so fancy! heal! so sorry! BTW I loved that movie years ago…DAS BOOT! and have been in that submarine when it was in Chicago! I have been healing from a mishap myself so I can relate to your hobbling. take care, y’heah? Wishing you better, Nice boot! 🙂 Take good care of it.